The Tasmanian Museum and Art Gallery is the premier museum of Tasmania, and so a logical choice for spending a few hours when visiting Hobart. As such, I sought out its hallowed halls to peruse the natural history, human history, and art displays, spread over two floors and two different historical buildings. 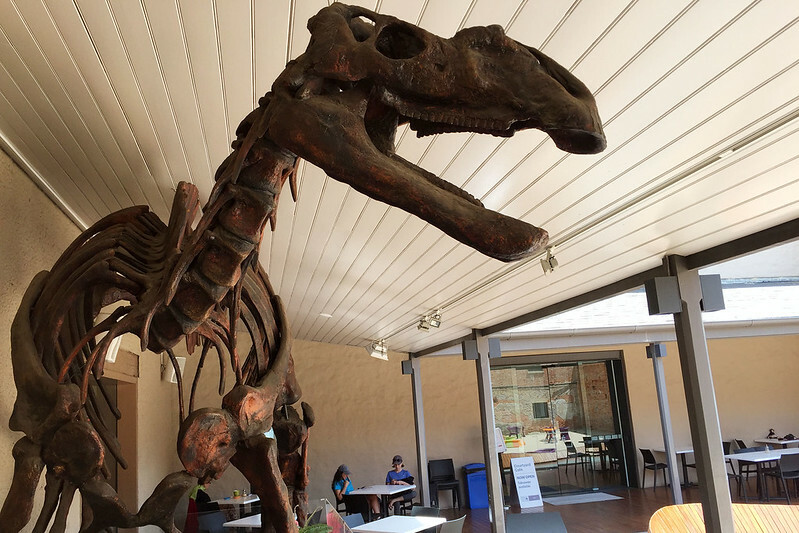 The interiors of the buildings have been modernised and hold state of the art displays and visitor amenties, including a cafe in the courtyard, aptly named the Courtyard Cafe, complete with Muttaburrasaurus skeleton outside. Sitting here for a rest and to eat the sandwiches we’d brought for lunch, Mrs Snot Block & Roll returned from inspecting the food for sale to report that there was a tray of vanilla slices! Naturally, one was acquired. It was delivered, along with Mrs SB&R’s coffee, to our outdoor table on the shady verandah. 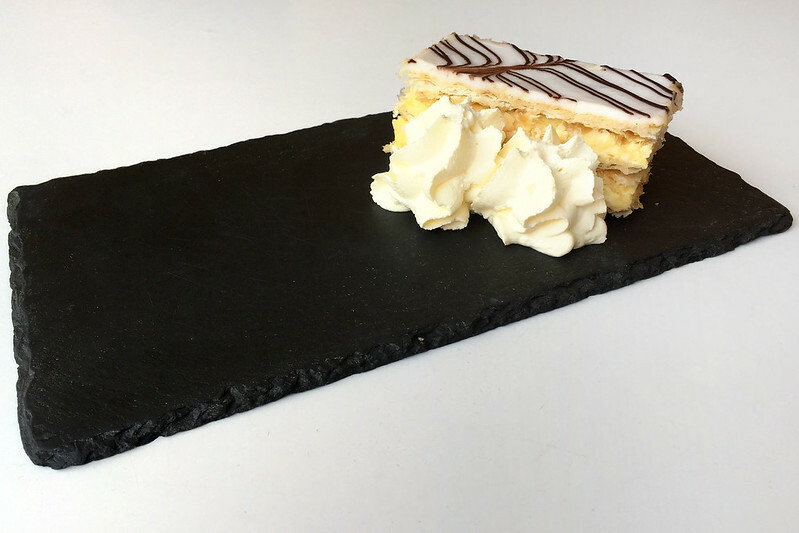 The slice was pretentiously presented on a large rectangular slab of slate, and garnished with two piped blobs of whipped cream on the side. After settling my beating heart at the sight of the slate tile, I inspected the slice. 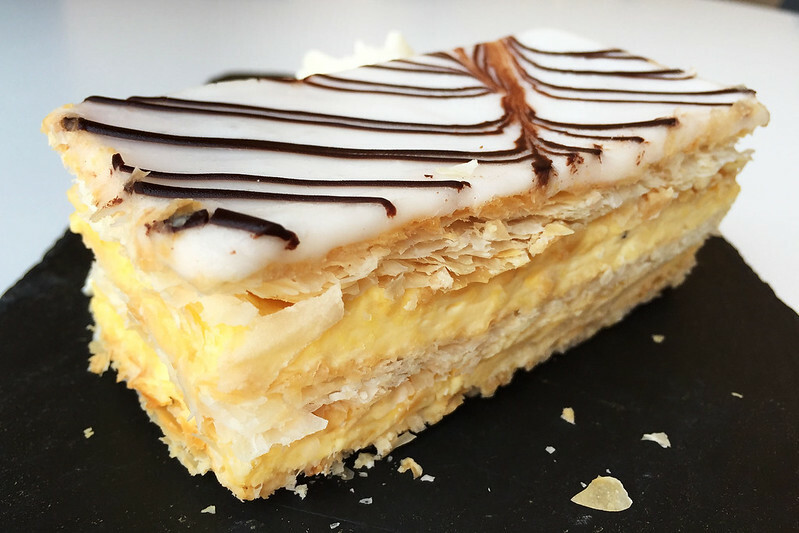 It has three layers of very flaky looking pastry and two of mid-yellow custard that looks agreeably creamy, topped with the traditional thin white icing with brown diagonal pattern. It looks pretty good, although the dragged streak line in the icing pattern is a bit sloppy. But if it tastes as good as it looks, this should be good. I pick it up and my fingers immediately stick to the icing. Sometimes that’s a good sign, sometimes not so much. Taking a bite, appearances fly out the window as the harsh reality sinks in. The pastry is disappointingly very soft and soggy, as if it had been sitting for a long time. Not a smidge of crunch left in it. This means the slice gives way easily and neatly, without oozing all over the place. The custard has also gone a little bit dry around the edges, but it tastes okay. 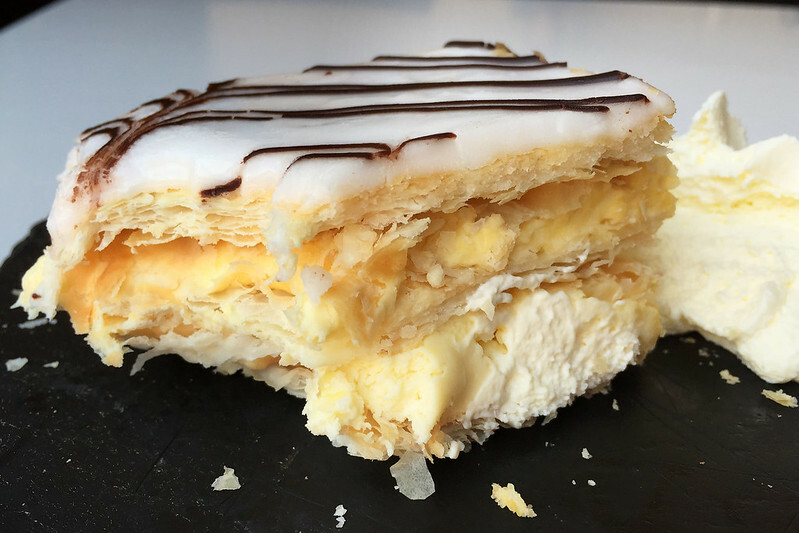 It’s nice and creamy, almost buttery in consistency away from the edges, and has a moderate vanilla flavour. The icing is thin enough not to interfere and overpower everything with sweetness. 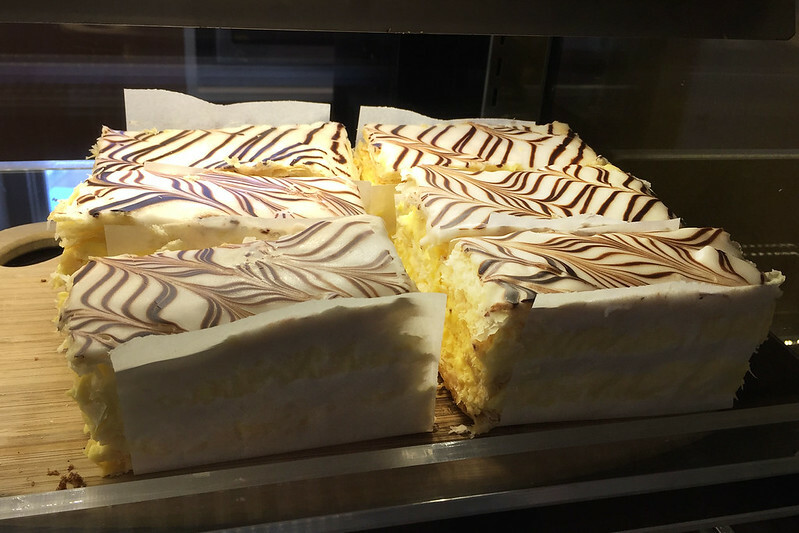 The addition of a bit of whipped cream with a mouthful of slice makes an interesting change of pace and works reasonably well. This might have been quite decent if fresh, but has to score on the low side because of the stale pastry.